The hilarious and much-loved comedy ‘Stepping Out’ chronicles several months at a beginners’ dance class. Led by their ever-patient instructor Mavis, and accompanied by an acerbic pianist, the students struggle and strive to to master the basics of dance. As they grow in confidence and skill, the students bond together in an endearing tale of determination, friendship and camaraderie with even the most bashful and shy dancers becoming powerful and proud performers. Author Richard Harris was inspired to write ‘Stepping Out’ after visiting a tap dancing class in his local church hall at his wife’s suggestion. The play was first performed at Leatherhead Theatre in 1984, directed by Julia McKenzie. Following a tour, the play transferred to the West End where it ran for nearly three years. In 1984 it won the Evening Standard award for Best Comedy. Liza Minnelli and Julie Walters starred in the 1991 film version of the play. 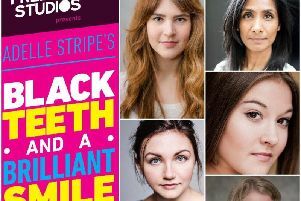 Halifax Thespians are directed by experienced actor and director Steve Tetlow in their production of the play which will be staged at Halifax Playhouse from Tuesday, June 16 to Saturday, June 20. This is the third time ‘Stepping Out’ has been staged by the Thespians and Helen Forsythe has appeared in all three productions. The cast also includes well-known Calderdale actress Cathryn Riley with Christine Noble-Doyle, Melanie Duff, Olinda Oleksewyck, Yvonne Kniveton, Emily Hurst, Francesco Rosado, Alex Holmes and Rae Laycock. The choreographer is Janet Fletcher. l‘Stepping Out’ starts at 7.30pm with a Saturday matinee at 2.30pm. Tel: 01422 365998.